Liu Chui-Kang was a native of the Chang Kuo County in the Liaoning Province. He graduated from the second class of the Central Flying School. At the start of the war, he served as Squadron Leader of the 24th PS (5th PG), stationed at Yangchou. This unit was equipped with Curtiss Hawk IIIs. During August and September 1937, he claimed a number of victories. At 08:40 on 23 August four aircraft from Ryujo under the command of Lieutenant (junior grade) Minoru Suzuki discovered a mixed force of twenty-seven enemy aircraft, including Boeing 281s, while they were scouting over Pao-Shan. The units engaged in battle and a total of nine (or ten) enemy aircraft were downed, including those downed by three aircraft of Suzuki’s force. Two of the Chinese fighters were claimed by Suzuki’s number two wingman, PO1c Masa-ichi Kondo. The Japanese fighters returned without losses. The China Area Fleet commander in chief issued a letter of commendation in connection with this battle. The Japanese fighters had engaged a mixed force of nineteen aircraft under the command of Captain Huang Kuang-Han, Squadron Leader of the 22nd PS, 4th PG. During the combat the Chinese lost Boeing 281 no.1702 flown by flight leader Gin Jia-Zhu of the 17th PS. Boeing 281 no.1704 flown by Ma Kuo-Lien was hit 23 times before making a forced-landing and turning over. Squadron Leader Captain Liu Chui-Kang of the 24th PS, 5th PG claimed an A4N south-west of Shanghai while flying Curtiss Hawk III no. 2401. At 10:00 on 20 September, 32 Japanese aircraft raided Nanking. Nine Chinese Hawk IIIs and two Boeing 281 s (no. 1706 and no. 1707) led by Squadron Leader Captain Liu Chui-Kang of the 24th PS, 5th PG were scrambled but didn’t intercept the Japanese formation. Suddenly six more Japanese bombers escorted by three fighters were spotted and attacked by Liu’s formation. Liu (Hawk III no. 2202) damaged a lagging enemy bomber before downing an E8N in the Nanking area. Lieutenant Le Yi-Chin (Hawk III ‘IV-1’) of 22nd PS, 4th PG, claimed a light enemy bomber west of Zhen-Jiang. Three of the Hawks suffered combat damage in this combat; Liu’s no. 2202, Le’s ‘IV-1’ and no. 2206. Boeing no. 1706 suffered some hit in the undercarriage and wings but all Chinese aircraft landed safely at 14:00. The Japanese A5Ms returned claiming four victories. Three of these were claimed by PO1c Watari Handa from Kaga (victories nos. 2-4 of a total of 13 – 6 of them claimed in China). 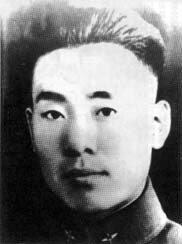 In October 1937, Liu Chui-Kang served in a provisional group consisting of the remnants of 3rd, 4th and 5th PG. There were two attacks on Nanking on 6 October where ten A5Ms fought two battles with 23 Chinese fighters in all, in which they supposedly claimed ten victories without loss. The first encounter at 10:30 between four Japanese bombers escorted by eleven fighters and twelve Chinese Hawks ended without any loss on either side. At 15:00, three bombers with five escorting fighters were met by twelve Chinese Hawks again in two groups, and the Chinese lost two planes. Shotai leader Kiyoto Koga of the 13th Kokutai (A5Ms) claimed three aircraft in this area during the day (victories nos. 5-7). Toshiyuki Sueda of the same unit, despite the fact that his machine guns were not operating properly, pursued an enemy aircraft until it crashed into the ground. This made him well known as the proponent of the ”Mutekatsu-ryu gekitsui” (“knock’em down without shooting ‘em”) method. At the same time, Sueda’s aircraft was hit and he was unable to find his bearing to return to base. He followed the banks of the Yangtze River and was able to return to base by evening. Squadron Leader Captain Liu Chui-Kang of the 24th PS, 5th PG claimed a damaged A5M south-west of Nanking while flying Curtiss Hawk III no. 2407. Flight Leader Wang Zhou of the 24th PS (Hawk III no. 2102) returned from a combat mission in the morning with 20 hits in his aircraft. Another Hawk III (no. 2109) flown by Teng Ging-Xiang of the 24th PS was damaged and force-landed near the artillery school during the afternoon. A third Hawk III (no. 2203) flown by Cadet Ma Jin-Zhong was shot down in combat during the day and the pilot was killed. On 12 October, the Japanese attacked Nanking with nine G3Ms escorted by eleven A5Ms from the 13th Kokutai led by Lieutenant Commander Nakano. Colonel Kao Chi-Hang led six Hawk IIIs, two Boeing 281s and one Fiat CR.32 to intercept. Wong Pan-Yang, in Boeing No. 1706, spotted the Japanese planes first. Diving on the tail end Shotai led by Warrant Officer Torakuma's A5M, Wong attacked the No. 3 plane flown by PO1c Mazazumi Ino (Pilot 30) and shot it down. Ino was on his first mission and may have mistaken the Boeings for friendly A5Ms. The Japanese formation broke down immediately into a melee as the Chinese fighters mixed it up with them for the first time in over a month. So surprised and confused were they that the Japanese later reported that Chinese "Breda 27s" surrounded them when in actual fact there were only two Boeings involved. Actually, Wong dived away right after his successful firing pass. He had pulled up to rejoin the battle when he saw another Japanese plane below. Diving into the attack, his map case broke loose and struck him in the face with such violence that completely disoriented him. Realising that a sky full of angry Japanese fighters was no place to be he dived out of the fight. Meanwhile, Kao was busy tangling with the A5Ms to give his comrades a chance to get at the bombers. However, the A5Ms were able to divert most of the attacks and even downed one of the Hawks killing the inexperienced sub-lieutenant Chao Fang-Chen of the 24th PS. Captain Liu Chui-Kang in Hawk III No. 2407 (or no. 2401) was hit and lost a bracing wire as he made a pass at the G3Ms. The A5M clung to his tail like a leech. However, next to Kao and Wong, Liu was probably the most experienced Chinese pilot. He led the A5M in a dive towards Nanking and then pulled up in a series of tight loops. On the 3rd loop, the A5M overshot, ending up squarely in Liu’s sights. A quick burst sent the A5M crashing into a Mr. Yang's residence in the southern part of Nanking. Back at altitude, Kao spotted an A5M closely pursuing Lieutenant Lo Ying-Teh, flight leader in the 24th PS. This was shotai leader Warrant Officer Torakuma trying to avenge his wingman. Not spotting Kao in time, Torakuma's A5M was riddled with gunfire and had to crash land on the banks of the Yangtse. The hapless pilot survived and was saved by the Japanese Navy. Lieutenant Lo also made good his escape but three A5Ms almost cornered Kao. Handling the Hawk III masterfully, using tight turns and even the outside loop, he was able to keep out of the gun sights of the Japanese pilots. Every so often, Kao was able to get in snap shot at the Japanese planes. Finally, two of the A5Ms broke off, probably for the lack of fuel. One continued to fly in a series of loops, seemingly oblivious to the Chinese plane. Kao finally managed to pull alongside the A5M and look into the cockpit where he saw the Japanese pilot staring straight ahead and clutching the stick to his stomach. His chest had been ripped open by bullets. Somewhere during the dogfight, one of Kao's snap shots had scored and the A5M was flying with a dead man at the controls. Eventually, the A5M crash-landed after it ran out of fuel. Kao went to examine the largely intact A5M and marvelled at its modern design. (This was actually the second A5M to be captured intact by the Chinese. On 26 September Lieutenant Lo Ying-Teh forced down the first A5M. Eventually, both A5Ms were turned over to the Russians and sent to the Soviet Union for testing). Japanese records showed that three pilots from 13th Kokutai were killed - PO3c Nagaharu Umeda (Pilot 32), PO3c Torata Takiguchi (Pilot 25) and Ino while four A5Ms were lost in this action, while claiming 5 shot down (all these claimes seems to have been made by the Torakuma shotai) and 2 destroyed on the ground. Only Kao, Liu and Wong made claims so there was no debate from the Chinese side as to who scored (except there were not enough details in the reports of both sides to match up the victims of Kao and Liu). It was the first time the A5M were trounced so convincingly and all the more remarkable as the Chinese were outnumbered as usual. The critical factor here was the experience of the Chinese pilots, particularly Kao, first Chinese pilot to single-handedly score a double-kill against the formidable A5Ms. On 26 October, Captain Liu Chui-Kang flew in his Curtiss Hawk III to Taiyuan in the Shansi Province to take over the command of the 28th PS (of which Louie Yim-Qun was vice-commander) as replacement for Captain Chan Kee-Wong, who had been injured in action on 21 September. Liu Chui-Kang was leading a flight of four Hawks to Taiyuan. At 07:00, the four fighters took off from Nanking, arriving at Hankou at 09:30. Leaving Hankou at 11:30, they arrived at 13:25 at Loyang. They departed Loyang at 16:15. By 18:00, they still had not reached Loyang but it was getting dark, and the planes were separated while getting through some clouds. Only one of the fighters were able to get back to Loyang safely at 20:45. Low on fuel and with the approaching darkness, Liu dropped a flare and tried to land, but hit a tower south of Taiyuan and was killed. The two other fighters also crashed – fortunately the two pilots, Tsou Keng-Hsu and Xu Bao-Yun were able to bail out safely. Liu Chui-Kang was posthumously promoted to Major. At the time of his death, he was credited with 7 biplane victories. During the war he was decorated with the Hsun Wei (2nd class) decoration. In April 1993, he was posthumously awarded the Seven Star Medal. His name can also be spelled as Liu Tsui-Kan.
Biplane victories: 7 destroyed, 1 probably destroyed, 2 damaged. TOTAL: 7 destroyed, 1 probably destroyed, 2 damaged. (a) Claimed in combat with four A4Ns from the Ryujo. Chinese fighters claimed one victory while losing two Boeing 281s. The Japanese fighters claimed two victories without losses. (b) This claim was never reported. (c) The Chinese pilots claimed four destroyed in this combat. 13th Kokutai lost three pilots; PO3c Nagaharu Umeda (Pilot 32), PO3c Torata Takiguchi (Pilot 25) and PO1c Mazazumi Ino (Pilot 30) (shot down by Wong Pan-Yang) and four A5Ms in this action. Warrant Officer Torkuma (shot down by Kao Chi-Hang) was safe. (d) According to other sources #2401. Information kindly provided by Raymond Cheung, Edward Chan, Tom Chan and Erich Wang.